What Targetprocess Triggers and Actions are Supported? New Iteration - Triggers when a new Iteration is added. New Request - Triggers when a new Request is added. New Team Iteration - Triggers when a new Team Iteration is added. New Build - Triggers when a new Build is added by user. New Feature - Triggers when new Feature is added by user. New Task - Triggers when a new Task is added by user. New Release - Triggers when a new Release is added. New Comment - Triggers when a new Comment is added to some Entity. New Bug - Triggers when a new Bug is added. New Time - Triggers when a new Time record is added to some Entity by User. New User Story - Triggers when a new User Story is added. Create Task - Creates a Task, a small chunk of work, typically less than 16 hours. Task must relate to User Story. Create User Story - Creates a User Story, a statement of end user requirements in a couple of sentences. User Story can be assigned to Iteration or Release. Create Comment - Appends a new Comment to existing Entity. Create Build - Creates a Build entity in a project. Bugs and source code Revisions can be assigned to Build. Add Requester to Request - Create new User-Requester and attach her to existing Request. Create Feature - Create a Feature, a high-level requirement which contains User Stories. Create Time - Create a Time record by User for specific Entity. Delete Entity - Deletes an Entity, which follows selected criteria. Create Request - Creates a Request, which can represent idea, issue or question from users. Create Bug - Creates a new Bug (defect, error, flaw, mistake, failure or fault in a computer program). Can relate to User Story. Can be assigned to Release and Iteration. Change State - Change state of existing Entity.. 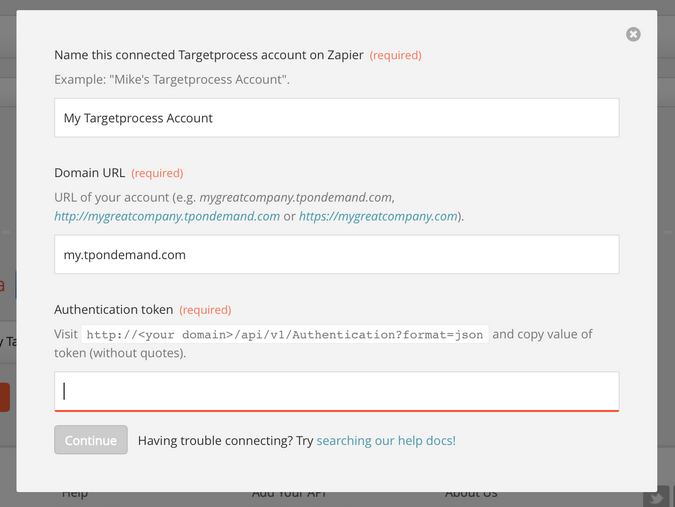 The first thing you'll need to do is connect your Targetprocess account to Zapier. Make sure you use the full domain of your Targetprocess account and make sure to omit the trailing slash at the end. Your Authentication token can be grabbed via http:///api/v1/Authentication?format=json. Paste the URL to a browser and you’ll see JSON with the token. As a final step, Zapier will automatically test if your authentication token is good, and you'll be allowed to continue setting up your Zap.